Handle electronics, and delicate parts safely! SAF-T-CURETM POWDER-FREE LATEX SURGICAL-TYPE GLOVES (CASE) offer protection for your hands and the delicate parts you handle. 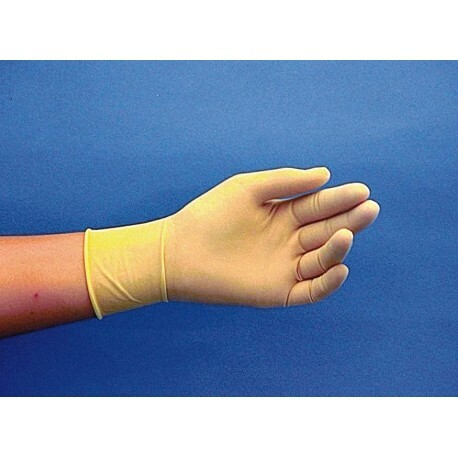 Constructed of 6.3 mil thick natural rubber latex, this ambidextrous latex surgical glove is manufactured without powder for safe use by workers who are allergic to powder as well as for handling electronic and other delicate parts highly sensitive to particulate contamination. Ideal applications: laboratory analysis and technical work, handling delicate and intricate parts, quality control, electronic assembly and other processes where freedom from particulate matter is important. Sold by the Case ONLY: 100 gloves/box, 10 boxes/case. LIGHT USE: Good chemical resistance upon short-term, intermittent and accidental exposure to many acids, alcohols, alkalies, and ketones. Features a longer cuff than other brands for full wrist protection.